Back to the climbing! After our ‘recovery day’ which left quite a few of us feeling quite tired, we decided on going to Cul de Chien. This tends to be one of the sites we go to when the weather doesn’t look quite as good as it’s basically a big sand pit with decent exposure to the wind. We all looked up when we heard a call coming from behind a boulder which sounded a bit like Andy. “Hello Patrick!”. Yes, it was him! He was just out on one of his daily runs and stumbled across us again. Even more strange, it turned out he’d run into Lolly and Jim yesterday after leaving us. Font definitely is like that. After a brief chat where he let us know that it wasn’t going to rain, he headed off and we got back to climbing. Working with Lolly, we did another 2 blues, both just really requiring high feet at the start and not much challenge higher, before I spied a red I fancied a go on. Coule Douce was only a 4+ but did require a bit of working out to get the balance right to totter up the rounded slabby corner. Rather happy with it, I then repeated it while demonstrating my beta to Lolly and Andy. Next I joined Lolly on a tricky little orange (which apparently used to be a yellow!) which spat me off a couple of times before I got up it. While a bunch of other people had a go, I wandered behind the boulder at our backs and found a great looking blue to try. A reasonably tall flat wall with a big overhanging diagonal flake on it. I pulled on and pretty quickly made my way up it, no problem at all, although the flake did seemed to groan slightly as I pulled on it. If that fell off it would have sliced my feet off, then squished me! Just as I hit half way and headed for the top, I started to feel rain drops. Uh oh! Getting to the top, it turned into real rain splattering down. I could see everyone scurrying around gathering gear and looking for a place to shelter while I tried to work out the way off the top of the 4-5 metre boulder I was stranded on. Realising there wasn’t an easy way off, I called Andy and Lolly back from their retreat with a bouldering mat and had to lower myself off the corner of the boulder onto a really polished slab with a big crack in. Wedging my arm in the crack, I managed to turn around and pad my feet down enough on the rapidly moistening rock, hanging on the arm jam low enough to be be able to drop onto the mat. Phew! That was pretty scary! We ran quickly to to a big overhang we’d seen earlier and set up for some early lunch under there. We had a brief “downpour” moment before the rain stopped and some sun started to peek back through. Unfazed, we started to make some plans for what was next, so I asked Jim and Lolly for some suggestions for a new project for me. Verglas Fréquent was the suggestion, a 6a+ slabby wall which Lolly had done at the peak of her climbing a few years ago. Being as we were waiting for the rock to dry out, we went to check it out and decided that “it was on!” and went back to ferry gear over. I spent pretty much the entire rest of the afternoon camped at the based of it working it, while everyone else pottered around doing oranges and blues and trying reds. 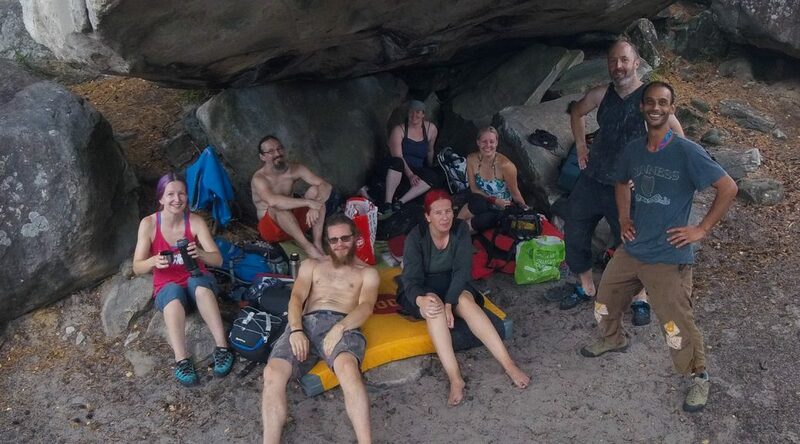 My experience on Acid a couple of days ago meant I was quite comfortable sat on the mats contemplating the problem in front of me with my shoes off, rather than feeling like I needed to get lots of climbing time in. At least for me, I don’t think constantly throwing myself at something hard, or getting large amounts of easier stuff in was going to help get me up the tougher grades. Instead I needed the time repeating the moves, with rest periods to consider why those moves didn’t work and how I could approach it differently. This problem was pretty much a perfect example of it. The boulder has a kinda of ledge in the bottom third of it which is where you want your right hand foot to go right after you pull in. It’s a pretty wide, but sloping ledge and Lolly managed to step up to a sloped divot on it on the left hand side when she completed it. I just couldn’t do this at all when I started working on it, instead coming up with my own approach where I’d step up further to the right and bring my left foot to the divot. From here, you had a poor left hand sloper and a slightly better little two finger crescent crimp for your right hand to pull off. From here, the next move was to bring your left foot up to something and push of it to reach for the top. 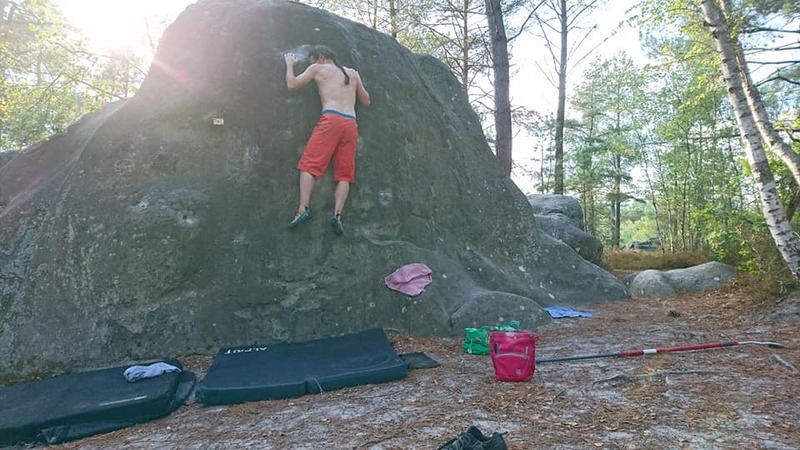 I got this first sequence completely drilled, pretty successfully getting myself comfortably up to the sloper and crescent most attempts but was really struggling to get my left foot up for the next move at all. After a lot of attempts I sat back looking at it, trying to work out why it wouldn’t work for me. Considering Lolly’s original beta of having her right foot in the high, left-hand divot rather than her left, I realised this meant she was able to get her left foot far more face on for the next foot hold, rather than slightly off to the left of her weight. This meant when she weighted it, it was far easier to prevent the foot from skimming off sideways. Reevaluating my approach, I realised I needed to start again and try and work out how to get my right foot in the right place, and starting trying to make it work. Eventually is did, finding somewhere on the polished bottom few inches where I could push off my leg foot hard enough to get the right in. It wasn’t great, but I could make it work and 10 or so attempts later i was back to where I was before… this time though I could push off that left foot and attempt a reach for the top……..
….. but that’s where I kinda got to. I had a few decent attempts, but I could feel my strength starting to wane and the tiredness setting in. I’d probably spent 4+ hours working on this problem, having fun while I was at it, but that was a lot of repeats of the same moves! As Ceri wanted to get back as she also had run out of beans and needed a guide out of the forest to the car, I decided to head back with her and help her make a start on dinner. Even though I didn’t get the project, I really feel it was time well spent. I really enjoyed the afternoon. 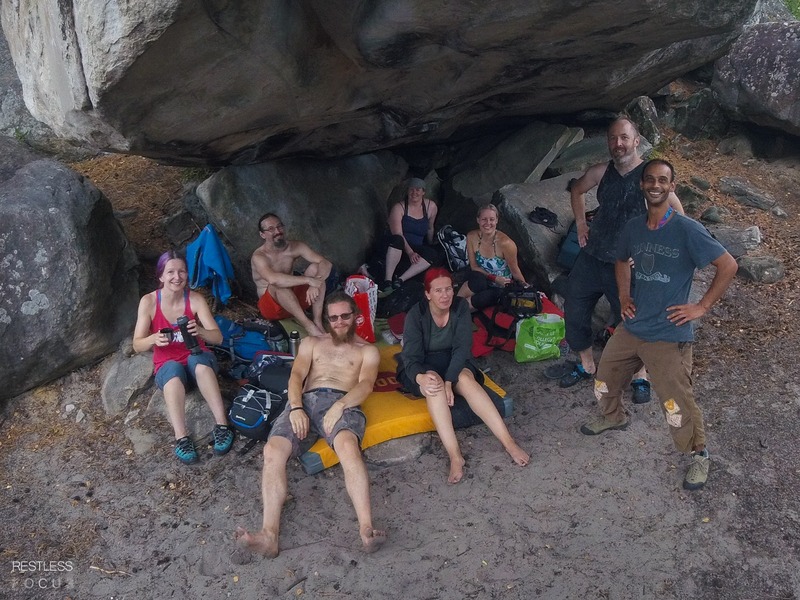 I feel sorry for Andy and the 4+ hours of GoPro footage of me falling off the same boulder over and over again though…..